Ah, The Pierre, a luxury hotel in New York City and one time home to actress Elizabeth Taylor, former Harrods owner Mohamed al-Fayed, and the French designer Yves Saint-Laurent. Charles Pierre, an immigrant from Corsica, began in the restaurant business in New York and over the years established social ties with some of Wall Street’s largest financiers. In 1930, they joined together to form a venture to build The Pierre, a 42 story hotel on Fifth Avenue and east 61st Street, in Manhattan. The Great Depression doomed the prospects for this and many other hotels, and it was forced into bankruptcy in 1932. J Paul Getty then purchased the building in 1938 and converted some of the hotel’s rooms into cooperative apartments. 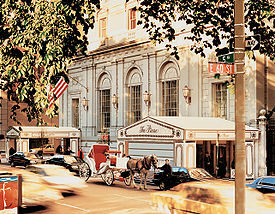 As of 2005, The Pierre is a Taj Hotel, a global chain of fine luxury hotels and resorts. Afternoon Tea was traditionally served in The Pierre’s famous Rotunda Room, but is now taken in their new 2E Lounge on the ground floor, a very modern space. 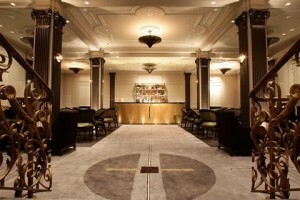 The 2E Lounge is a hip New York bar that doubles as the Afternoon Tea venue during the appropriate times of day. As I was seated by the friendly and affable staff and began looking through the Afternoon Tea menu, I noticed twelve different full-leaf and herbal tea selections on the menu. Since I was in the mood to try something different, I asked my server if she had a recommendation for something a little out of the ordinary. After a short discussion, she suggested I try one of her favorites, the Taj Spiced Chai, which was later brought out steeping in a glass teapot. 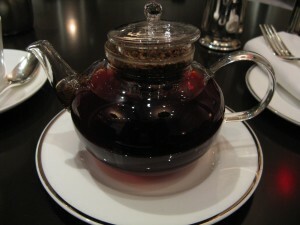 It was really quite distinctive and a good alternative to the local house blends that I usually choose. Compared to most of the tea rooms that I have visited, this was a definite change of pace in that the 2E Lounge at The Pierre is a new, chic, and contemporary setting to take afternoon tea. It’s popular with New Yorkers who are either having cocktails or getting together with friends or perhaps holding an impromptu business discussion. It’s a great place to have a light snack and/or a refreshing drink. After enjoying my tea for awhile, the three tier stand was brought out, and I immediately noticed the Organic American Caviar Tea Sandwich. This was a special treat, so I decided to try it first. What a wonderful addition this was to the typical afternoon tea savoury offerings! One of the other memorable savouries was the deviled egg with baby watercress sandwich – great flavors here. Finally the English cucumber with smoked trout tea sandwich was a standout. The cucumber was chilled and delivered a nice cool crunch in the mouth. The scones were “ginger” and served with Devonshire Cream, Berry Preserves, and Lemon Curd, although the waiter told me I had crème fraiche, rather than the Devonshire Crème listed in the menu. The ginger flavoring was subtle, yet provided a nice accent to the scones. The sweets included a green tea crème brulee that was great, I thought, but the best sweet was definitely the opera cake. I have to say that the staff was very solicitous of anything I needed at The Pierre. It seemed like whenever I asked for something, it was available, and they were always prompt and courteous. Sometimes you take this for granted in a luxury hotel, but it’s always a pleasure when you experience it again, first hand. 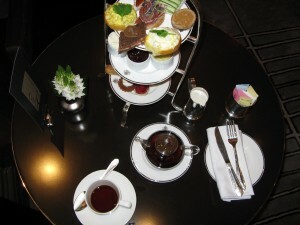 This entry was posted in North American Teas and tagged afternoon tea, high tea, new york, new york city, Pierre Hotel, tea, tea sandwiches, The Pierre. Bookmark the permalink. What type of tea have you been drinking lately? What was your last "luxury" purchase?